YES – I survived the first four weeks! In case you aren’t familiar with how BBG works and are interested in possibly trying it, let me give you a quick run-down. Every week, there’s 3 resistance training sessions, 3 LISS (low-intensity steady state) sessions, 1 recovery day, 1 rest day, and 1 optional challenge. Ideally, you’ll want to stretch and foam roll as frequently as necessary throughout the week to help your body recover. For the sake of simplicity, I have kept up with Kayla’s calendar: leg day on Mondays, arms & abs on Wednesdays, full body on Fridays, and LISS on Tuesdays, Thursdays, and Saturdays. On some LISS days, I’ll schedule in recovery if I’m feeling sore, or throw in a weekly challenge if my body can handle it. Sundays are rest days spent recovering. Despite how easy Kayla makes her exercises look, the resistance training is NO joke! Minus warm-up and cool-down, each session is 28 minutes long, with 2 circuits of 4 exercises. She has 7 minutes allotted for each circuit, to be completed twice. You’re supposed to repeat the exercises until the 7 minutes is up. Of course, there’s a minute or so dedicated to a quick rest/water break in between each circuit. 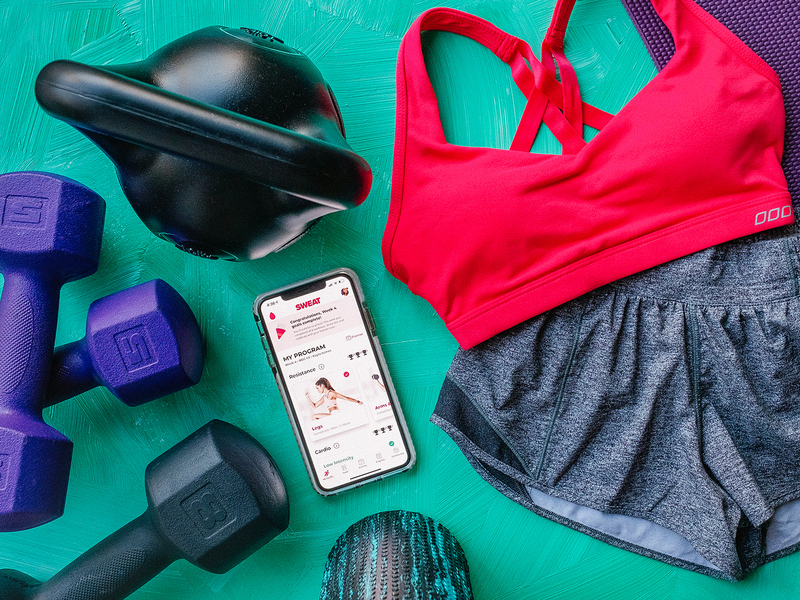 I am NOT one to sweat easily… but let’s just say, it’s not called the SWEAT app for no reason! When I first started, my LISS sessions were mostly spent on the treadmill for 30 minutes at 3.8 mph with no incline. The weather got really nice in Palm Springs, so I started alternating between treadmill sessions and outdoor walks. My outdoor walks would go for 30 minutes as well, around my neighborhood. Eventually, I got a little bored of just walking every other day because I walk even on non-LISS days. So, I started throwing in 30 minutes of steady rowing at the gym instead. I found this to be a great way to not only complete LISS, but also work out my arms and back, minus the intensity that comes with resistance training. As expected, getting through the first week was challenging. I had to take breaks often in between & during exercises, and leg day absolutely KILLED me. I was sore from the next day all the way until full body day. Push-ups were hard; I started out on my toes and ended up on my knees towards the end. On average, I got through 1-1.5 rounds per circuit in the allotted 7 minutes. For LISS, I stuck with treadmill only at 3.8 mph, no incline, for 30 minutes. To ensure that my body could endure the full week of resistance training, I stretched and foam rolled very often. Foam rolling hurt a lot, but definitely helped speed up recovery. I managed to complete the 300-rep arm burner challenge for the first time. Leg day this week was a LOT harder than last. There are a lot more jumping exercises, which I’m not the biggest fan of… burpees are my weakness! Needless to say, I had to take a good amount of breaks in between exercises, but still kept a steady pace. For LISS, I switched it up some between outdoor walk and steady rowing for 30 minutes each. I felt a little defeated because I was told that I needed to start incorporating protein shakes after my workouts if I wanted to see results. I tried a whey protein shake that David made me and it was absolutely HORRIBLE. Even with plenty of tasty berries, the aftertaste is not something I can handle. I felt discouraged but decided there had to be other ways to get the protein I needed. I already eat high-protein foods like eggs, fish, lean meat, and greek yogurt. Health & fitness shouldn’t be dreadful or you’ll give up, and I’m not about to let this bring me down. I’m willing to take the slower progress and in the mean time, figure out foods that I can eat (AND enjoy) to maximize my results. Recommendations are welcome, but I can’t have peanut butter or any nuts as I’m allergic! Protein bars are iffy too because they may be produced in nut facilities… and well, they also don’t taste great from my experience so far. I wasn’t as sore as I was in the first week, so I completed the 600-rep ab challenge right after arms & abs resistance. During the challenge, I learned that it wasn’t the best idea to do these back to back, because I couldn’t finish the challenge well without sacrificing form. I still made it to the end, but was totally dead afterwards. I found a blog post that Kayla shared with high-protein smoothie recipes! Some with NO protein powder. THANK GOD!!! I gave the first one a try with some modifications. I didn’t have oranges, so I skipped that but incorporated a banana, frozen berries, oats, flaxseeds, and greek yogurt. It was AMAZING. This will be in place of the “protein shake” for me, for now. And probably for a while… haha! Leg day doesn’t seem to get any easier… lol! My arms & shoulders were unusually sore, so I might have worked myself harder than I did before on arm day. My period came on Friday (full body day) and I still surprisingly CRUSHED the workout. I did have to substitute the burpees with one-minute planks though, because my body wasn’t having all the jumping. LISS was a combo of 30 minutes walking and sunshine, or rowing as usual. Building up the endurance – I got through 1.5-2 rounds per circuit in the allotted 7 minutes. 😉 Surprisingly, I felt an unusual surge of energy. This week, I managed to get through a total of 4 resistance training sessions (the extra one targeted abs because I just LOVE ab workouts), 5 LISS sessions, and the 300-rep arm burner challenge again. BOOM! All that and barely sore at all – my body is responding well! LISS was a combination of rowing, treadmill, and outdoor walks for 30 minutes each. Since beginning the challenge, I’ve realized that I get hungry often and have been eating heaps more – healthy foods, that is! Overall, I would say that the changes in physical appearance have been quite subtle so far. I’ve noticed more changes in how I feel, rather than how I look. Like many, I seek instant gratification but know that building muscle on my body will take time. My body definitely feels stronger now that I have made BBG part of my lifestyle. I’ve been nourishing my body with fresh whole foods and plenty of water. As a result, I’m more energized, productive, and feeling a lot of happy hormones… I know that’s a thing now! Even on rest days, my body will crave exercise which I never thought would ever happen. All that, in itself, is a life-changing accomplishment worth celebrating! The PRE-BBG photo was taken on January 1st this year. Before starting the challenge, I did do a few “trial runs” of Kayla’s program on-and-off with my gym routine & fitness classes at the time to get a feel for it. With that said, I toned up just a bit from before I worked out at all. So no, I didn’t always have abs – though my stomach has always been flat and body fat percentage low. In November 2018, I was pretty much starting out with absolutely no arm muscle at all! Prior to the challenge, I was under 100 pounds (fluctuated between 95-97 pounds). Gaining weight has always been a struggle for me (but I’m still thankful for my fast metabolism haha). 4 weeks into BBG, I have FINALLY broken 100! I am at 101 pounds (45.8 kilograms) now – about 10-15 pounds from my goal weight in muscle. For me, even the littlest gains are wins 🙂 This journey has been eye-opening not only because I’m getting stronger, but also because I’m feeling more connected than ever with my amazing body! For those who have or are participating in BBG – What was your experience like? When did you start noticing physical and non-physical changes? Congratulations on your obvious success on this challenge. I hope the next month makes your feel even stronger! You go girl! It’s a tough program fo sho, but really rewarding. Congratulations on your fitness achievement. Doing this consistently must be pretty tough. You are very determined. Great job and I am not a fan of protein shakes. Health is the key to long term happiness.Happy to read your experience & how you have taken up the challenge. Thanks for sharing your review babe! I love Kayla and have done her programs. My changes weren’t drastic but also noticed a difference in my feelings and strength like you mentioned! Isn’t this app amazing!! I’m using it too and I can see a huge difference in my body and my stamina. This sounds like such a great program! You look amazing girl. I know you say the results are subtle, but I can tell a huge difference! It’s interesting to read more about how this program is working for you when you do it consistently. Because of my health and ALL my insane allergies (mostly to healthy foods), keeping up with a consistent fitness program is really tricky. I like BBG a lot, but it’s really hard for me to find a good balance with it. I’m learning a lot about my body though, for sure. And as far as protein additions go – I love Vital Proteins. Their original powder has zero taste – and that’s coming from someone who HATES the taste of protein powders AND gets super nauseous really quickly. I add it to my smoothes, but they also have a coffee creamer version! I’m so amazed by your determination. I’ve heard this is a hard program but you’re crushing it. Can’t wait to get the next update. Congrats! Keep up the good work. More Abs photos! Keep it up! It’s a long way ahead but it’s fun to read your journey. Don’t give up on your goal! Oh my gosh, perfect timing! I’ve been planning to do some workout to gain muscle or at least build my also slim body. Thank you for your detailed information and congratulations on your results! You look great! If you already have strength and endurance built up I would recommend going straight into BBG Stronger haha you might get faster results! But I’m loving the original BBG program so far because like I said, I started out with no muscle at all hahaha (especially in the arms)! Congratulations on completing the first 4 weeks! I’m sure you’ll be able to achieve your goal for the muscle mass. What are your favorite dishes while doing the 12-week BBG challenge? Thanks for sharing ! Now need the same motivation to do so i haven’t sorkoyt since …. I don’t know when I might try her programs. With Kayla’s program, I love that I don’t have to step into the gym wasting time deciding on what to do haha everything is already laid out and I can smash a workout in 30 minutes! 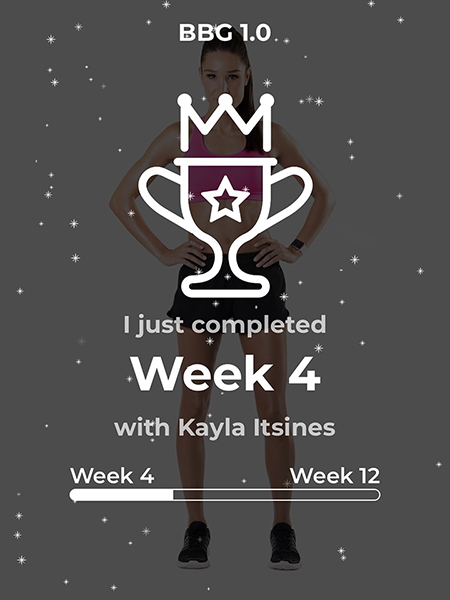 I’ve been wanting to give Kayla Itsines’ challenge a go for a while but have heard it is really difficult. Your results look amazing though so I think I should! Amazing that you were hardly feeling sore by week 4 as well, that makes me feel more motivated ahah. Way to go girl for doing this! I’m about 8 months postpartum and thought about doing this to tone up. You look amazing!! Keep on rocking it! It typically takes me a couple of weeks to notice stamina and endurance changes. I appreciate that this program seems well organized and easy to follow. Thanks Marcie! I thought I was getting stronger and building up endurance until this week… LOL she introduced new workouts and leg day totally killed me like how it did on week 1. Not going to lie, felt like I was going backwards but I know it’s still progress because she’s making the workouts more challenging for the next 4 weeks haha! Ok, I think I need to start this. What a difference!!! Such a great way to get your exercise in, and it doesn’t take a lot of time out of a busy day! Great job on obtaining your goals! You look fabulous; I love a good circuit workout too! Thanks Sara! I haven’t quite reached my goals yet but that’s good because it keeps me going 😉 haha!! I want to generically scream you go girl ! So I will you go !!! That is wonderful. I am so happy that you are sticking to your goals and felling great I imagine! You look amazing! Your before photo wouldn’t even be my after 🙂 I always see Kayla on Instagram. I should try her program. Keep at it and after it! Small wins are what propels us to larger wins and keep us motivated to move forward. I have abs, somewhere. They’re just hiding for now. 🙂 Great work. Hey, sticking to a program like this is tough stuff! That’s so awesome that you’ve made it through four weeks already! Thank you so much Vanessa! It’s been so much fun! Hahahah! You already looked great, but I applaud you for taking it to the next level! I’m on a fitness journey myself to gain more muscle. I’m fun seeing the results and getting the compliments. Keep at it, I’m right there with you! Her programs look interesting. I see a lot of advertisements for it, but I’ve never tried any. I definitely find that the first week back to any type of workout program is the hardest because it’s like culture shock to your body. Her program definitely lives up to its hype! 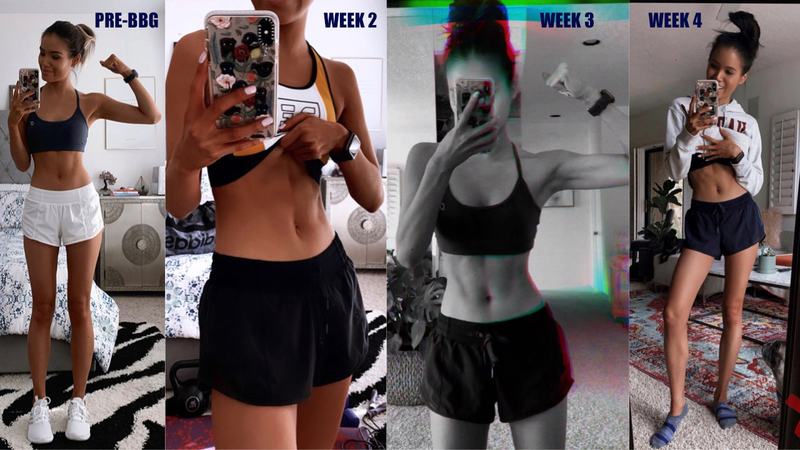 Yes, I totally know what you mean about the culture shock – I wanted to avoid doing that to my body which was why I decided on original BBG first and then working my way up to BBG Stronger after these 12 weeks are up! I am the worst at sticking with a workout routine. I will get all amped up and then realize after the first day, while dry heaving from over exertion, that this working out thing is just not for me. But then I also realize that as I get older the ol’ metabolism does not want to work as effectively as it used to so healthy eating and working out has become an absolute must. I like the sound of this program and think I will check it out. What an absolute delight. Workout and endurance is key to keeping fit and healthy! Very inspirational. Congratulations! I love how this program is set up. Completely resonable steps so you’ll actually do it, big enough steps that it has effects. Best of luck in y our second month! Yes, totally! Thank you Lene! OMG girl you look so fit!! I wish I had your dedication and motivation to hit the gym. I’m starting to go to the gym more frequently and slowlyyyyyy seeing some results. It seriously takes time until you see the results from working out. This looks like a challenge that I would consider! Way to go! Your commitment and determination is so amazing! You look fabulous! Sounds like a smart program with balance of cardio, strength, plus some rest (we earn those days, for sure, right?). No matter now fit I get, I will never like burpees either, they’re just tough! Glad you’re feeling the strength in your abs. Keep it up! Yes, burpees are killer! Haha but they definitely work out the entire body 🙂 Thanks for the encouragement, Megan! Wow! If my abs will look like yours, I’m in! Congrats on finding a plan that works for you! You’re just the sweetest! Thank you. Finding a plan that works is half the battle, really! I’ve been doing a FitBit challenge with burpees in it. I am pretty sure I execute them with the grace and precision of a walrus. Lol. But they definitely work. I love that you’re appreciating the small victories as you go. A victory is a victory, no matter how big or small. Congrats, and keep it up! You can do this! Whoa! Way to go Sharon! I’ve heard about apps like this but never tried it out, now I def want to give it a try! This looks intense! I’m not going to lie…I thought BBG meant Big Beautiful Girl…and I was slightly confused at first lol. Woww! You did it! Congratulations on sticking to this fitness plan! I want to confess one thing – looking at your pre BBG photo, the very first thought of a lazy person like me was, why does she need to do any fitness program ??? Lol!! Keep it up girl. Wow! That looks intense, but you’re doing amazing! Thank you Angie! Haha intense for sure! Congratulations for sticking with the program. It’s great that you’re seeing results. Great job finding a program that speaks to you. Sometimes that is half the battle. Glad you are seeing the results you were after. Keep up the good work! I couldn’t agree more! Excited to see where the rest of this 12-week challenge takes me. Thanks, Lora! This sounds amazing Sharon! Huge congrats to you dear! This is such a helpful post!! I’ve been wanting to try bbg for a long time! Thanks Whitney! I was very surprised at how hooked I got to the program after starting it. Honestly never really thought I’d look forward to working out! This program looks like it is intense but would give you the results if you work at it. You are killing it!